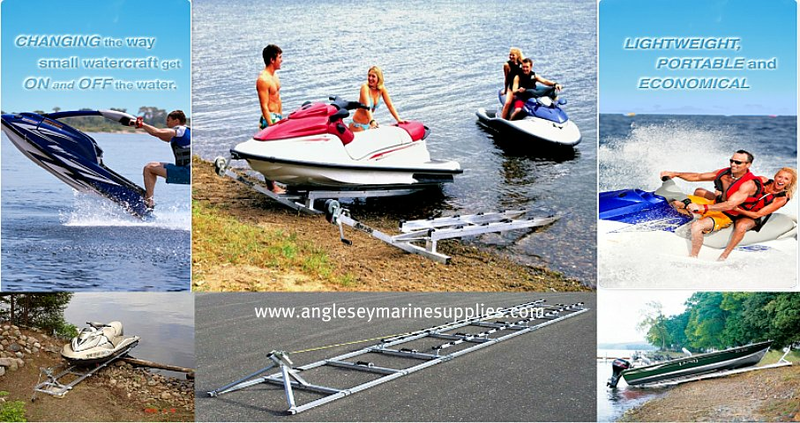 Anglesey Marine Supplies offer a range of Jetski and Pwc, Personal Watercraft Accessories. We supply sand anchors, jetski fenders and bumper protectors, jetski drybags, jetski mooring lines, impeller protectors, jetski lanyards, aqua grip safety vests etc. 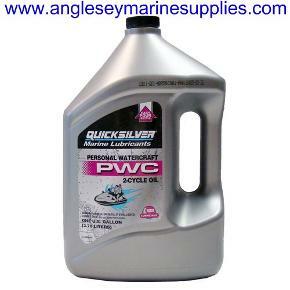 This range of jetski pwc products as been recently added and is updated daily. 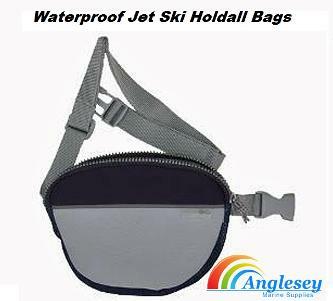 Lightweight Jet Ski fluke anchors, Sand anchors, waterproof bum bags, jetski two stroke oil, jetski launching carts, tachometers, launching ramps. The Aqua Grip jetski pwc vest is a must for riding passengers on a 2 or 3 seater jetski, personal watercraft. 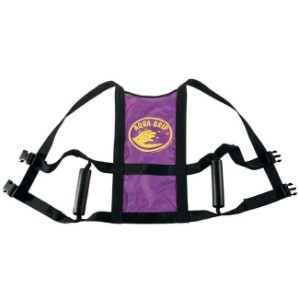 The vest fits comfortably over any lifejacket, with dual adjusting buckles. Soft foam handles attached to the sides of the vest give passengers a confident and safe ride while not restricting the driver. Comes in 3 colours, please use drop bar menu for choice options. Lightweight jet ski anchor fluke anchor system. This vinyl coated fluke anchor only weights 1kg, but is perfect for jetskis, pwc, small boats, canoes and khayaks, inflatables etc. Is supplied with 8m of marine grade rope and contained in a sturdy nylon storage case for added protection while being towed. Displayed in a clampack. 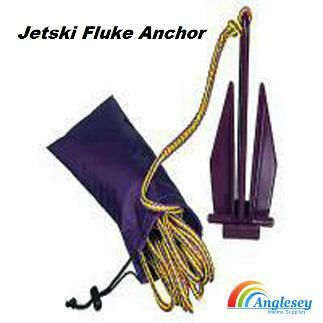 Jet Ski sand anchor, ideal for mooring, anchoring in shallow water in calm conditions. 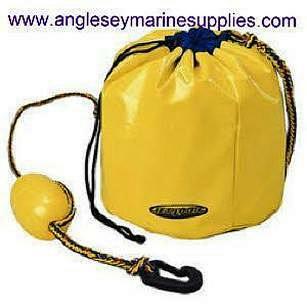 Simply fill the durable nylon anchor bag with up to 15kg of rocks or sand. A buoy will mark the anchors location. 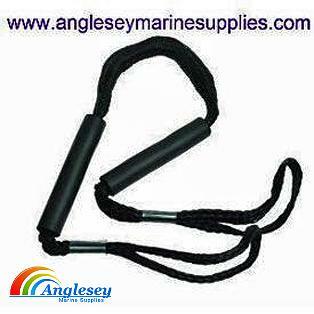 Tieing up is easy with the 2m long marine grade rope and large nylon snaphook. Comes supplied in a clampack. Jet ski grapnel anchor system. 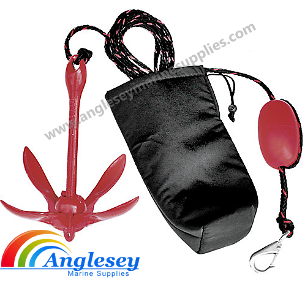 Uses a coated 1.5kg folding anchor 8m of marine grade rope, a floating buoy and a large nylon snap hook to attach to Jet-ski. Is all contained within a padded nylon storage case for added protection and to dampen noise while stored away. Displayed in clam pack. The ultimate pwc jet ski safety lanyard. This one has it all. 3 keys to fit all brands of pwc, seadoo, yamaha, kawasaki, polaris, tiger shark etc. Super comfortable floating detachable wristband, floating vest lanyard and high pitch pealess whistle for emergencies. A swivel snaphook prevents the cord from tangling. Supplied in 2 colours, purple/yellow or red/black. Keep those wate rski ski ropes away from impellers with our jet ski pwc impeller protector. Simply run your ski rope through the middle of the close cell foam tube with nylon cover. This will protect your impeller from the water ski rope.. 24" long. 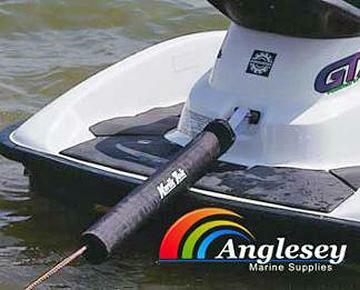 Jetski Pwc impeller protector from Anglesey Marine Supplies. 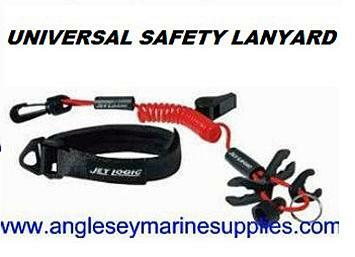 These 2 metre long jet ski mooring line rope have a 26cm spliced loop at each end. A closed cell foam chafe guard protects the jetski or boat from rope abrasions. UV, mold and mildew resistant. The purple, yellow and red colour scheme matches all pwc, jetski and boats. Sold in pairs. These jet ski Pwc fenders (3" x 18") have nylon covers and attach to the jet ski via two giant suction caps or secure under the hood or seat. 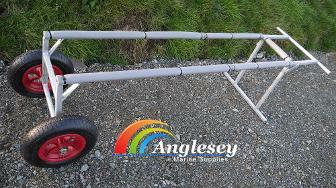 Ideal for mooring or tying up beside another boat. Supplied as a pair in a clampack. Jet ski two stroke oil, quicksilver two stroke oil, engineered to meet the demands of seadoo, kawasaki, and other personal watercrafts that specify the use of a API-TC oil. Synthetic blend. Ashless TCWIII jet ski two stroke oil gallon ( U.S. ). 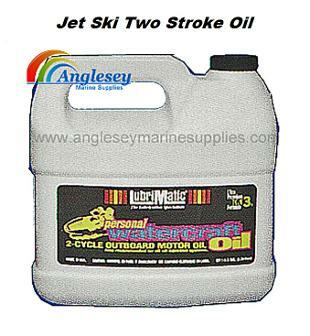 Two cycle 2 stroke personal watercraft oil, sold in U.S gallon containers. New Neptune 2 personal watercraft instrument. 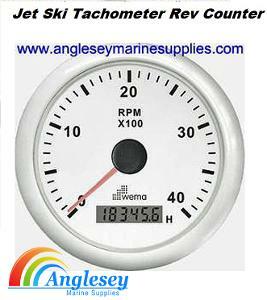 Jet ski tachometer rev counter, Personal Watercraft, PWC Tachometer, Rev Counter. 0-8000rpm jetski tachometer with 4 pole alternator. Jetski rev counter. 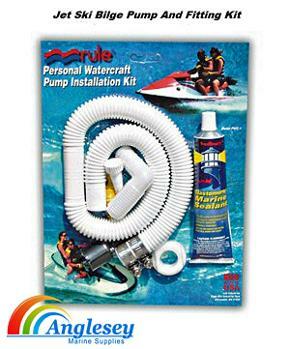 Pwc bilge pump, jet ski bilge pump installation kit. 3/4” 19mm hose, comes complete with all clips, hose. sealant, skin fittings etc. A Superb piece of kit, our Jetski launching trolley,Jetski tote, dolly, is ideal for the launching of boats, dinghies, jetskis etc or can be used for the launching and recovery of dinghys or tenders. Or as a workshop stand or cart. Manufactured from 30mm box section galvanised steel, fully adjustable support rails. Comes with large pneumatic launch trolley wheel. Packs down to easily fit into a boat or car boot, van. Ideal for Seadoo, Yamaha Jetskis. Pull the cart onto the beach whilst you sunbath. 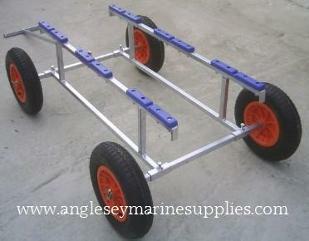 New product for the 2015 forthcoming season our fully galvanised jetski tote, Jetski launching trolley,dolly. fitted with large 14" pneumatic wheels, manufactured from 25mm box section fully galvanised steel. Fitted with large 14" pneumatic wheels held on with simple to remove lynch pins. 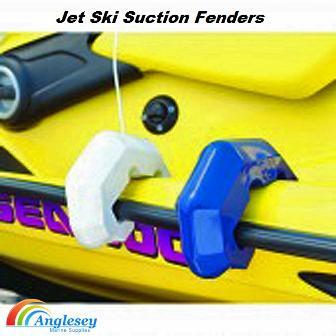 Set at a reasonable height to allow the jetski to be retrieved and then loaded onto a jetski trailer or into a van etc. Jetski pwc boat launching ramp. Launch your Jet Ski easily in and out of the water in just seconds with our Jetski launching ramp. Lightweight, portable and economical - just 54 lbs. 15" rail spacing will handle any PWC, including all 3-person models. Overall length of 11 feet, long sections available. Max weight capacity = 1,000 lbs, overall width = 30" Rail width adjustable 11"-14" Winch - Zinc plated, 'dead lift' rating = 900 lbs, Gear ratio 3:1, strap length = 15 feet, hook with nylon PWC loop. We also make smaller sections that could be used to carry your jetski in a van or goods trailer etc. Triple hook ratchet tie-down. 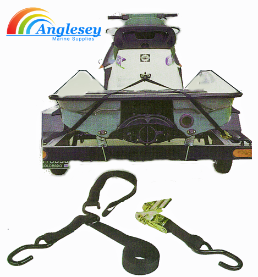 Jetski tie down strap is the perfect way to secure jet ski to the trailer. Three coated hooks and 2.5m. of 25mm. heavy duty strap makes this the universal tie-down for all PWC’s.